Succulent, lemony monkfish garnished with sprigs of fresh thyme is perfect with mashed potato made with puréed fennel and garlic. A large monkfish tail looks stunning, but you could use one or two smaller tails (allow about 900g filleted weight). Serve this dish as it is, or, if you like, add wilted spinach as a side dish. Preheat the oven to 180ºC, gas mark 4. For the mash, place the fennel and garlic on a baking tray, drizzle with the oil and season. Roast for about 20 minutes, then remove the garlic, return to the oven and roast the fennel for a further 10-15 minutes or until tender. Allow to cool slightly. Meanwhile, cook the potatoes in boiling water for 12-15 minutes until just tender. Mash until smooth, adding the yogurt and butter gradually. Place the garlic in a food processor with the fennel and cooking juices. Blend until smooth. Pass through a sieve to remove any bits of garlic skin and fennel. Mix with the mashed potato and season to taste. Keep warm. Turn the oven up to 200ºC, gas mark 6. Lightly oil a non-stick roasting tin and place the garlic and sliced lemons in the centre. Place the fish on top and season well. Pour over the wine and Pernod (if using) and drizzle with the oil. 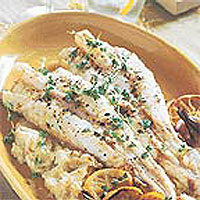 Roast the monkfish for 25-35 minutes, basting occasionally until it is cooked - it will be white and opaque. Place the fish and mash on a serving dish and drizzle with the roasting juices. Scatter the thyme, garlic and lemon over. The mash can be made in advance and warmed through just before serving. To save time, use a 450g pack Waitrose Mashed Potato from the chiller cabinet and mix with the fennel purée.